We’re currently in the process of adding QMS document management to a FileMaker solution for one of our clients, CMMS Global of Anacortes, Washington. FileMaker’s document management functionality, particularly external container storage, works very well in this application. In this case, we have the good fortune to have a working model on which to base our system design. For a number of years, we’ve had a QMS system in place in Seattle for a local 3M division. This system was written in 4th Dimension, and so did not simply drop into place in the new application. After a GoToMeeting review of the project for CMMS Global this past week, we’re pleased to report they’re extremely happy with the QMS system we’ve put in place for them. Anticipating that we may use this QMS interface again in the future, we made extensive use of modular techniques in FileMaker 16 to allow for quicker deployment in future systems. By keeping the definition of document categories and subcategories in data rather than structure, the system can be largely re-worked without programming changes. This will make it easier for CMMS Global to adjust the system on the fly and will make it easier to use this module in other projects if the need arises. 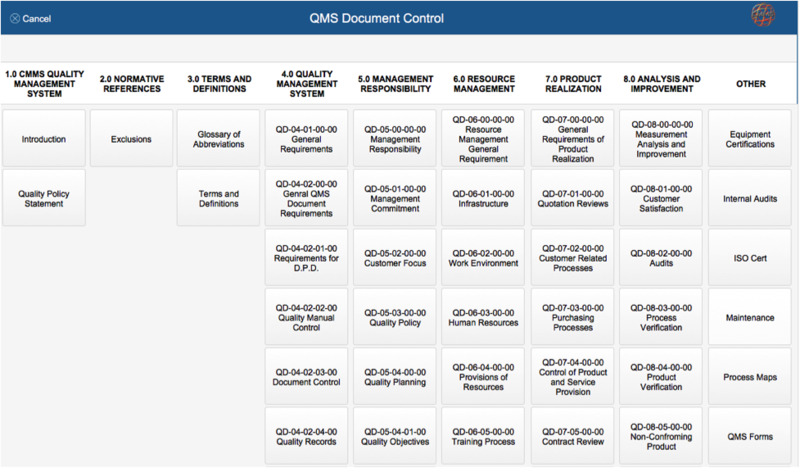 Portion of QMS document navigation interface. Clicking on the subcategory displays all QMS documents in that subcategory. FileMaker’s remote container feature is particularly useful in a document management system like this. The ability to have shared documents without the requirement of an underlying file sharing system really simplifies configuration.